Help Mama Pig protect and save her piglets from the foxes. The foxes come and steal the piglets, take them away and lock them in a cage. Mama pig sits in a basket armed with a bow and arrow. The basket is mounted on a tree on a pulley system and she can move up and down the treetrunk. This is where the surreal element to Pooyan kicks in. How do the foxes get to the piglets? By balloon, of course! There are two distinct attack waves: one where the foxes float down the screen and then steal the piglets, and the other where the foxes float up the screen, and team up to push a large rock onto Mama pig's head. How do you stop the foxes reaching the piglets? You kill them, by firing your arrows and bursting the balloons. 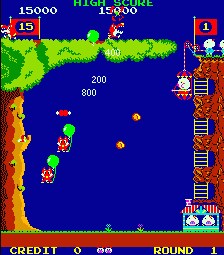 When you burst a balloon and a fox is travelling on it, it falls to the bottom of the screen to its death. 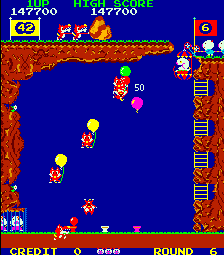 To clear the screen you must kill the required number of foxes stated on the countdown board at the top left of the gameplay area. Just firing arrows at foxes on balloons would be a little to easy - so the foxes have a few tricks up their sleeve to make your life just that little bit more challenging. They have the ability to throw rocks at you while they are ballooning to knock you out of your basket, and if they reach the tree the climb the ladder on it, and try to push you out of your basket. As well as the arrows you can also collect a piece of meat which appears at the top of the screen periodically. When thrown, the foxes in its path let go of their balloons to try and grab it, thereby plunging to their deaths. This is especially useful for racking up points destroying formation fox attacks, when sometimes up to five foxes arrive on screen at once and all start ascending/descending the screen together. You get bonus points for killing more than one fox at once. 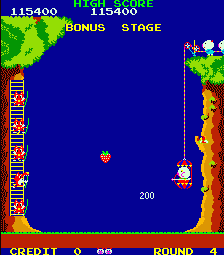 After each two stages, there is a bonus stage where you have to shoot foxes for points or hit fruit which is thrown at you. If you hit everything on screen you score bonus points. The last fox on each stage is a tougher breed than normal, and takes 5 hits to kill. If you fail to kill him and he makes it to the top or bottom (depending which level you are playing) five more foxes are added to the counter. This decreases your chance of completing the level so you really should try to kill the last fox as soon as it begins its ascent/descent. The gameplay is very good in Pooyan, set at just the right difficulty curve, and it is well complimented by the colourful graphics and cheery sound effects. 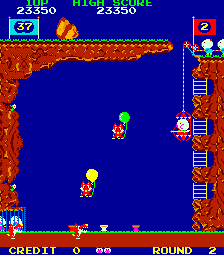 Pooyan was released on many platforms after the original arcade, and its simplicity yet addictive gameplay saw faithful conversions on the C64, Atari 800, etc. You start the game with 3 lives and extras are awarded at 50,000 points and every 80,000 points. Scoring Shooting a balloon: 200 points. Shooting a rock: 200 points. Killing multiple foxes: 200, 400, 800 & 1,600 points. The foxes always appear in the same sequence. Learn when the formation attacks are coming, in order to pick them off for higher scores. Some balloons take two shots to destroy. Be wary of this when a fox is approaching the top/bottom of the screen (depending on the level). Never worry about letting a couple of foxes get past you. On the downward stage they are easy enough to avoid, and on the upward stage it takes seven to get past you before you lose a life.